Frank G. Cannata Honored By Seton Hall University | Industry Analysts, Inc.
By Cathy O’Brien – Frank G. Cannata, CEO and president of The Cannata Report, was honored by his alma mater with the Monsignor Joseph Granato Italian Culture Award bestowed by The Charles and Joan Alberto Italian Studies Institute of Seton Hall University during a ceremony at the university’s Bethany Hall on Tuesday evening. 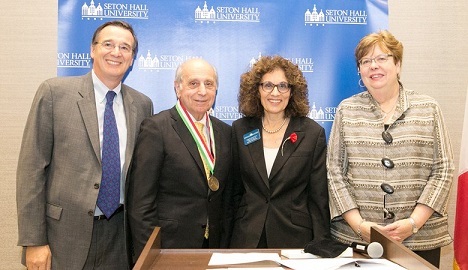 Cannata, previously honored with the university’s Humanitarian of the Year Award, was recognized for his lifelong support of his alma mater and his instrumental contributions in the creation of a world-class Italian Studies program at Seton Hall. Dr. Mary Meehan, interim President, and Dr. Karen Boroff, interim Provost, presented Cannata with his award at the ceremony attended by university dignitaries, faculty and staff. Also in attendance were Cannata’s associates from UNICO National, an Italian-American service organization, as well as industry colleagues, friends, and family. This entry was posted in Uncategorized and tagged Frank Cannata, Seton Happ by IA Staff. Bookmark the permalink.